I would like to talk for one moment about squishy chair etiquette. By squishy chairs, I am speaking specifically about those soft comfy chairs found in coffeeshops and libraries. They are usually set apart from the four-top tables, and are sometimes set up in groupings like a friendly family room. 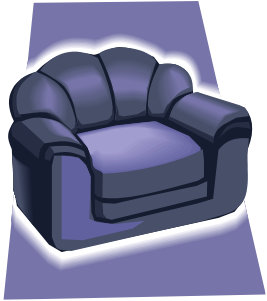 Like you could be sitting in your pajamas or boxers and it would be just fine, because you’re in the squishy chairs. You know what I’m talking about. I love the squishy chairs. When I’m going someplace to write, as soon as I walk in the door, I scan for them. Is there one empty? Good, it’s mine. According to the book of etiquette that I have written in my mind, if all the squishy chairs are empty, you have a right to sit in any one you choose. But if there is one squishy chair occupied, you have a right to sit anywhere except directly next to the person who is already sitting in the said chair. Let me give you a real-life example. I walk into my second favorite library the other day to do some writing. I’m excited because I am by myself! I have an hour or maybe even two to be in my own space and write! No one is crying or smashing toys together or eating day-old cheerios off the floor! Obviously not your typical Thursday evening for me. I find the quiet reading room where there are: two work tables and chairs on one end of the room, and a fireplace and eight squishy chairs on the other end. The squishy chairs are lined up against two adjoined walls, so they form an “L” and all of them face the fireplace. In other words, no seat is worse than any other- they all face the fireplace, they all have a view of the door- not a bad seat in the house. When I first walk in, I have the place to myself and I choose the chair furthest from the door, in the far corner of the room. So there is one chair directly next to me and six chairs on the adjoining wall. I am blissfully writing when I glance up to see a very nice looking lady walk into the room. I immediately look back down to my screen to let her know I’m all business, no chitter-chatter to be found here. She pauses for a second and walks past the two tables and six empty chairs and sits down right next to me. To me, this was the approximate equivalent of sitting in my lap. This kind of squishy chair intimacy was totally uncalled for. The appropriate social distance would have been to sit with at least one chair in between us, if not more. But the line had been breached and now I was listening to her breathe and turn pages from a distance of not more than 24 inches. My bliss bubble popped and I powered through my work and headed out. If this were an isolated incident, I probably wouldn’t be writing this post, but I tell you, I have some concern because the exact same thing happened again today, just now, in fact. I was sitting on a squishy chair in a coffeeshop, this time we were dealing with a rectangle formation- two chairs on one side, one on the other, one on each end and a coffeetable in the middle. I’m again blissfully writing, when all of a sudden a sweaty yoga guy comes and sits directly next to me. Three other empty chairs not next to me and he picks the one where I can reach out and touch him…Too close, my friend, too close! Is this a direct result of social media? Are we so far away from each other metaphorically that now we have to sit in a stranger’s airspace like we’re on an airplane in order to feel connected? I’m disturbed. Because the etiquette book in my head distinctly states that there really isn’t an appropriate response to this behavior other than staying put. Getting up to move into a different chair as soon as someone sits down next to you is rude. As is saying something like, “I’m saving this seat for Daniel Craig.” Plus, what if you get up and move one chair over and they get up and move next to you again, following? That’s just awkward. I must ask, is this a normal trend? Is your etiquette book different than mine? Am I just so attractive that people can’t keep away from my airspace? I’m looking for answers, people! I await your responses. This entry was posted in life in general and tagged humor, is it me, personal space on September 10, 2013 by skylikeme.